I remember starting my blog to share film reviews and I guess it blossomed from there to other things, thought I’d revisit that and share my thoughts on films again! Okay how did I manage to watch this before everyone you ask? Odeon: Screen Unscreen. It’s a special screening by odeon whereby you get to watch an unknown film before its release date for only £5 per ticket. So it’s a bit of a gamble, but definitely worth it. Prices are so high these days as it is and so far the movies that have been shown have been brilliant. They’re definitely not rubbish films. The special screenings occur at least once a month, check your local cinema for more details. Oscar winning director Alejandro Gonzalez Inarritu brings us ‘The Revenant’, an epic true story of one man’s search for vengeance after being left for dead on a frozen waste. 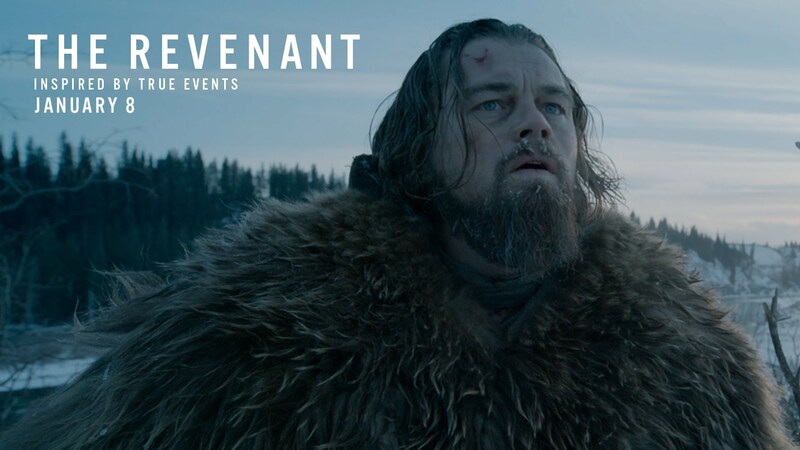 The Revenant was a brilliant, gripping, and dramatic film intensifying all emotions. First off the settings and locations for the movie was well sourced, the lighting throughout was fitting to the scene and depicted the ambience of the scene at that very moment; I liked how the light shone through trees representing the glimmer of hope that Leo’s character needed reminding you that there is a chance for his survival/ revenge, and reminding you that as long as you are still breathing, to never give up. Alongside the great nature shots captured, the use of original music by Ryuichi Sakamoto and Alva Noto, captured the stillness perfectly showcasing the perfect balance of calmness and quietness creating a beautiful tense atmosphere that has you gripped to your seat. I’m not sure about the accuracy of the film and nor do I know how they managed to film certain aspects of the film; it was gut wrenching to watch the scenes where they “eat”. How they managed to film those scenes I do not know, but as actors they did an amazing job, and Leo definitely put more than 100% into this role. Both Leonado DiCaprio and Tom Hardy were amazing throughout the film and played to the camera well, the intensity and dedication both actors bought to the film was magnificent; their eyes told a story that no others can tell. It was well captured and shot. Perfect lighting and angles: job well done. Even though this was a brilliant dramatic film which I can understand why it is up for 4 Golden Globe nominations I’m struggling to accept that Leo will win an Oscar for this movie. His acting was well played, however I feel like it doesn’t warrant an award. It just wasn’t enough, there was definitely something missing. From what I have seen from previous productions and winners this film/ role doesn’t add up and equate. As for Tom Hardy, if he was nominated for Supporting Actor, I wouldn’t be surprised if he won it for this role. However, that would definitely be a kick in Leo’s face. I mean heck, maybe I’m just cynical where I could be wrong and for once he really does win, that’s a moment I’m waiting for, but I’m trying not to get my hopes up because I know it’ll come crashing down when he doesn’t. Overall, the movie was gripping, it had everyone in theatre quite and captured their full attention. It definitely is well worth a watch, the cinematography throughout needs an honourable mention, it was well shot; every emotion and feelings was brilliantly captured I cannot recommend it enough.